Swiss musicians Sara Käser (Cello), Hans Hassler (Accordion), and Elias Menzi (Hammered Dulcimer / Hackbrett) are invited to spend 8 days is Egypt, along with 5 Egyptian musicians from the famous Mazāher Ensemble, between April 16 and 24. This residency workshop aims to develop an international cultural exchange between Swiss and Egyptian musicians with a specific focus on connecting ethnic and traditional cultures with modern expression, exchanging expertise to revive old music forms through modern creative innovation. 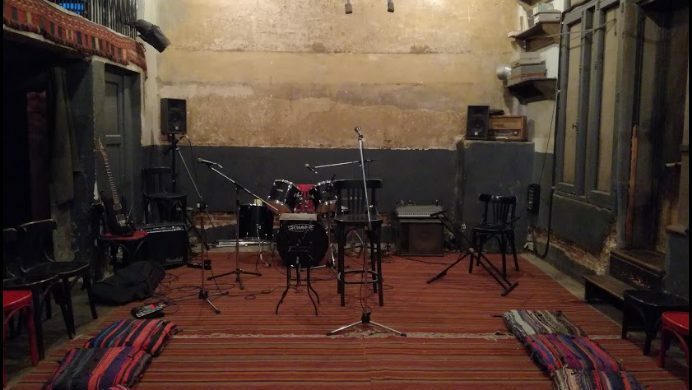 Musicians will have time to explore and experiment together in Cairo and in Tunis village (Fayoum), developing and composing their music collectively, and bringing different musical traditions and sounds. The workshop is organized in collaboration with the Egyptian Center for Culture and Arts (MAKAN). Mazaher is one of the rare ensembles in which women play a leading role and are connected to a most ancient tradition practiced in several countries in the region. The musicians of Mazaher: Um Sameh, Um Hassan, Nour El Sabah are among the last remaining Zar practitioners in Egypt. The music presented by Mazaher is inspired by three different styles of the Zar music in Egypt: The Egyptian or Upper Egyptian Zar, Abul Gheit Zar and the Tamboura or African Zar. Zar is a community healing ritual of singing, polyrhythmic drumming and dancing whose tradition is carried mainly by women (men have the second roles) and whose main participants are women. It’s distinctively different from other Egyptian music traditions. born 1945 in Graubünden, East Switzerland. Hassler is called as the true Swiss king of accordion. For over 30 years he has developed a style which incorporates Swiss folk music, jazz, film music, free improvisation and classical interpretation. Hans Hassler inspires the listener with his playful virtuosity, a good sense of humour and a musical imagination without borders. Swiss musician who started playing the dulcimer in his early years of his childhood. Later, his horizons began to expand, which led Elias to visit Töbi Tobler’s lessons, which had a lasting impact on his playing. The versatile musical interests later also moved him to take steps in the direction of jazz. Menzi enjoys the richness of the colors of his dulcimer and tries to duplicate it with the continuous development of his game. And at the moment Elias Menzi deals with folk music from near and far and abroad, dedicates herself to free improvisation and writes and plays her own pieces. This both solo and in various projects. Graduated in 2011 with a Bachelor of Arts in Music from Lucerne University of Music. At the moment she is studying in the Master at the same University Interpretation in Contemporary Music with Erik Borgir. She plays in various chamber music formations from the duo to the 6tet, attended chamber music classes with the Guarneri Trio, John Storgård, Helen Lindén-Pons and Annika Palm-Doumenge. Inspired by cellists such as Erik Friedlander and Okkyung Lee, she also improvises on the cello far from the classical tradition. With her trio Sekhmet she devotes herself entirely to free improvisation. Through her musical openness, she also joins projects with actors, dancers and poets.